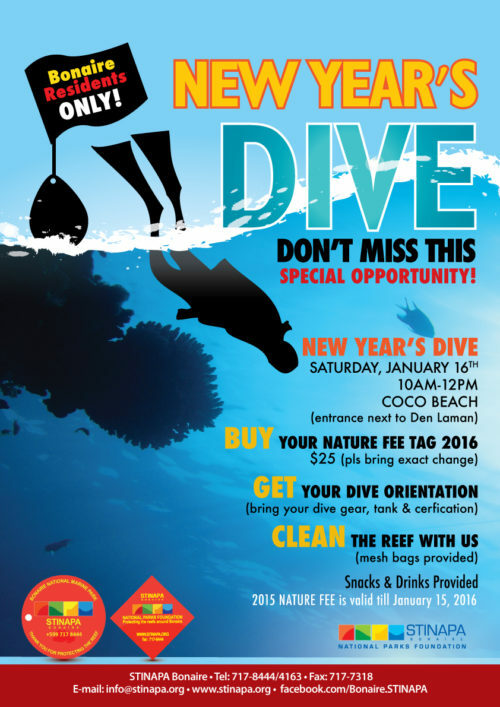 The Dive Tag (nature fee) of 2015 is valid through January 15, 2016. So on January 16th, STINAPA will organize a New Year’s Dive at Coco Beach, entrance next to Den Laman, where we will sell the 2016 dive tag to local residents only. We will be at the beach from 10 am – 12 noon to give the marine park orientation and supervise the buoyance check dive. This is a one-time opportunity! So come prepared with $ 25 (exact amount please), your dive gear, tank, certification and don’t forget your sedula. While you are in the water doing your buoyancy check you may want to collect some garbage underwater! 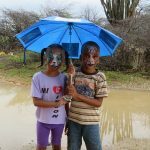 We will provide mesh bags, courtesy of Yellow Sub ‘Debris Free Bonaire’ program. If you are a licensed lionfish hunter, by all means bring your gear and hunt. Of course, anyone who already has a 2016 dive tag is welcome to join the clean-up!